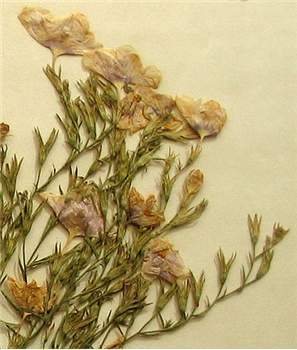 Part of herbarium specimen of Nierembergia hippomanica (AD). Typical Nierembergia stigma (R) and stamens (Q). Reproduced from Engler & Prantl's Die Natürlichen Pflanzenfamilien IV 3b fig. 5 (1897). Nierembergia Ruíz Lopez & Pavón, Prodr. 23 (1794); after the naturalist Juan Eusebio Nieremberg (1595–1658), a Spanish Jesuit and first professor of natural history at Madrid. Perennial herbs, glabrous or pubescent with simple or glandular hairs. Leaves alternate, rarely paired, mostly simple, entire, sessile or petiolate. Flowers solitary, terminal or in upper leaf axils, bisexual, slightly zygomorphic. 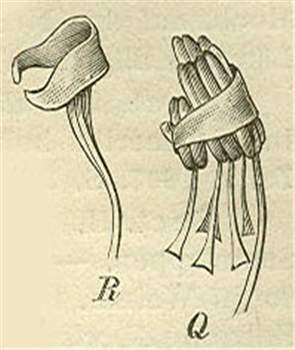 Calyx tubular to obconical, 5–lobed. Corolla white or violet; tube slender, elongate; limb expanded, campanulate to funnel-shaped, 5–lobed, the lobes induplicate in bud. Stamens 5, inserted at summit of corolla-tube, 4 in pairs, the 5th shorter, exserted and surrounding style; anthers bilocular, ventrifixed, dehiscing by longitudinal slits. Ovary bilocular; stigma expanded, bilobed. Fruit a smooth capsule, opening from apex, the valves deeply bifid at dehiscence, enclosed by persistent calyx. Seeds prismatic. A genus of c. 30 species mostly native to Argentina and adjacent countries in South America, with one disjunct species in North America. One species commonly grown as a garden ornamental in Australia and sparsely naturalised in N.S.W. R. Millan, Revision de las especies del genero Nierembergia (Solanaceae), Darwinia: 487–549 (1941); D.E.Symon, The solanaceous genera, Browallia, Capsicum, Cestrum, Cyphomandra, Hyoscyamus, Lycopersicon, Nierembergia, Physalis, Petunia, Salpichroa and Withania, naturalised in Australia, J. Adelaide Bot. Gard. 3: 133–166 (1981). Only Nierembergia hippomanica is sparingly naturalised in most Australian states.